Nief Norf Projects presents: PIANISTS “The Rite of Spring and new works for piano duo” featuring Christopher Adler and Andrea Lodge. New Thread Quartet heads to Baltimore to perform and work with students at Peabody Conservatory of Music. 1 E Mt. Vernon Pl. The saxophones of New Thread Quartet perform music by the composers of Music for Contemplation (MuFoCo). Music for Contemplation aims to engage a completely new audience for radical contemporary music in a historic church through a series of six concerts dedicated to presenting compositions with open structures, quiet dynamics and use of silence. 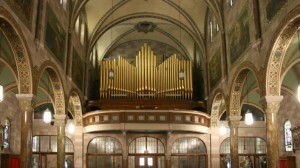 Taking place at the Church of the Annunciation in Williamsburg, Brooklyn, the series offers new music with a special focus on the contemplative nature of listening. The series includes premieres of works by five New York composers.